Inspired by my laundry tonight, I wrote and posted a new diary entry. Doesn't that just make you want to go and read it? "Brad Rowe: If any thespian is prettier than [Rob] Lowe, it's Brad Pitt, right? And since Pitt is too big for the small screen, The West Wing ought to appoint as Lowe's successor Pitt lookalike Rowe, a pretty younger thing who needs an established show to rescue him from flops like Spin City and Leap of Faith." All twenty-one pictures from the wedding last weekend in Sacramento now have titles and descriptions. Maybe they'll be easier to understand this way. Dan and I went to Disney California Adventure today, so I should have some new pictures to post soon. I just read that a Boeing 727 operated by FedEx crashed on approach to the Tallahassee airport this morning. Apparently all three crew members survived, but it is still an odd occurrance for my hometown. So now that I've made "Sacramento Wedding 2002" a public photo album it should be viewable by everyone. Sorry about that. In other news, I got an apartment today! More on that later. Many thanks to Dave Berman (Dan's best friend) who sent me links to pictures from the wedding last weekend. I have posted some of them in the new "Sacramento Wedding 2002" section of my photo album. (One of these days I'll start posting pictures on this site instead.) They don't have proper titles or descriptions yet, but I will add them by this weekend. Right now it's my bedtime, though. This week is devoted to apartment hunting. I am driving up to Bel Air this evening to check out the guest house I wrote about last week. On Thursday I have three appointments to look at apartments near UCLA in the afternoon. And if those don't work out I'll go back on Saturday. Hopefully I'll have a place to live by next week. I forgot to bring my camera to the wedding in Sacramento, but hopefully some of Dan's friends will email me (lcgleason@juno.com) pictures to illustrate the weekend. Right now I have to get ready for work tomorrow. I should be in bed in half an hour. I'm heading to Sacramento for the weekend. I have to get up at 4 AM to catch the airport shuttle to LAX, so that'll be a fun start. More updates when I return. This afternoon I made my first LA apartment-hunting contact. I talked to a woman in Bel Air who is renting her guest house. I'm trying to convince myself that I am emboldened by this success so that I will call other people about apartments. Why does it make me so nervous? Another new diary entry has been posted. This one is a bit more recent the the last few. OK, it's about time for bed. Click on the pictures of my cats above to see a larger version of the image. (No, the date on the picture isn't right. This was taken just a few weeks ago.) Aren't they precious? 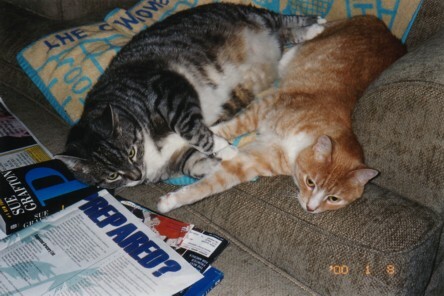 The fat gray one is Bob and the thinner orange one is Tom. They are my babies! I have posted this image in my Yahoo! photo album. There is also a new picture in the "Graduation 2002" album. It is the professional picture that was taken when I shook hands will the dean at the ceremony. All of my diary entries (for this year, at least) will now be archived in the 2002 Archive, which has finally been completed. Since I only have links to the monthly archives, the individual entries are listed underneath the month in which they were posted. I just posted two new diary entries and they both appear on the main diary page. I also added the July 2002 link to the diary page so that all of my entries are archived there. Back to Harry Potter. The problem with reading Harry Potter books is that all other projects fall by the wayside. I have a cross-stitch design that I want to make for my aunt, but reading "Harry Potter and the Prisoner of Azkaban" seems to be top priority instead. It may be a bit late (and out of order), but I just posted my diary entry from May 23 which is all about "Star Wars: Attack of the Clones." It isn't as complete as I would like, but I have forgotten all of the brilliant things I meant to write in the past month and a half. Several other half-written diary entries are lurking all over my computer so there will be more stories to come. I'm still working on a good archive for the entries too. For now there's just the May 2002 link. Sorry this is all taking so long. I just bought the ugliest suitcase in existence for my trip home in August. It is a grayish-greenish floral print that no one would ever want. Maybe that's why it was on sale. I am hoping it will help me distinguish my luggage from everyone else's at airport baggage claim. Not that it will be much of a problem in Tallahassee, but LAX is slightly more busy. "What's the coolest thing you've ever seen?" John Williams conducting the LA Philharmonic which was playing the theme from "Star Wars" (composed by Williams) at the Hollywood Bowl. Yes, it was an encore performance last night at the Fourth of July Fireworks Spectacular. I was on the edge of my seat with a huge grin on my face through the entire song. It is probably the coolest thing I have ever seen. "I liked him better before he was dead." Dr. McCoy (regarding Spock), "Star Trek V"
On Friday, as I was packing for my trip, I found my "Fellowship of the Ring" movie ticket in a purse I apparently haven't used since December. I was wondering what had happened to it! My dad and I saw the movie in Biloxi, MS on December 20. Along with the movie ticket was a Sonora Arizona Desert Museum pass from December 17. What a packrat I am. Anyway, the trip to San Francisco was a lot of fun and now I am back at work. At least Thursday is the Fourth of July.